All they can see is darkness. All party to the disaster. All dues-paying when the time to choose is forfeit. From under ashes into sudden flame. The corpse waters have taken them. Stunned speechless by the indifference of the world. Of what is lost because always remembered. As angels pass on, turn their backs. The chilling spray of shallow pigments, the undried tears. The cost, rich with nature withheld. The smear of fish gall on our victims’ eyes. Pockets of air sucked out of every crevice. And the dead foundered on roofs, police targets. Of helplessness as it mingles the wet skin. As the injured lie dying, sunk in the eyes of the sea. D.S. 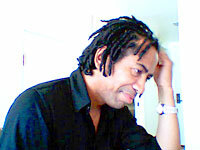 Marriott is the author of Incognegro (Salt Publications, 2006), and two cultural studies, On Black Men (Columbia University Press, 2000) and Haunted Life (Rutgers University Press, 2007). He teaches at the University of California, Santa Cruz. Copyright Notice: Please respect the fact that this material is copyright © D.S. Marriott and Jacket magazine 2006; it is made available here without charge for personal use only, and it may not be stored, displayed, published, reproduced, or used for any other purpose.